In this easy activitiy children will examine seeds for similarities and differences. Give children a large number of seeds and ask them to separate paper into two sections or draw two circles on a piece of paper. Ask them to organize the seeds into four distinctive groups (such as smooth and bumpy, long and round, fruits and vegetables, and so on). No seed can be left over. Now draw another circle or section on the paper. 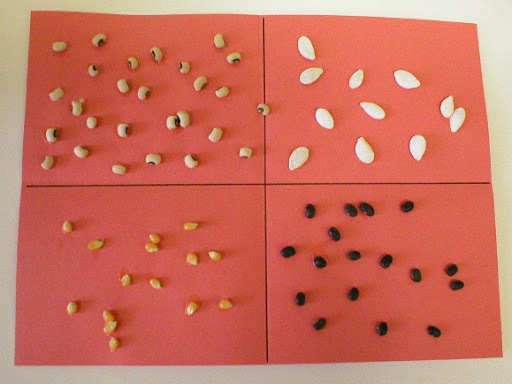 Try organizing seeds into three distinctive groups. Then try four distinctive groups. Have children explain why they chose the categories. As a challenge try grouping them even more specific groups. OMG when kids ysed to misbehave in a childcare center I worked in we would have them sort seeds. Ha ha. Really neat activities on this site, I like the learning aspect of the springtime experiments!